The vote has finally taken place. 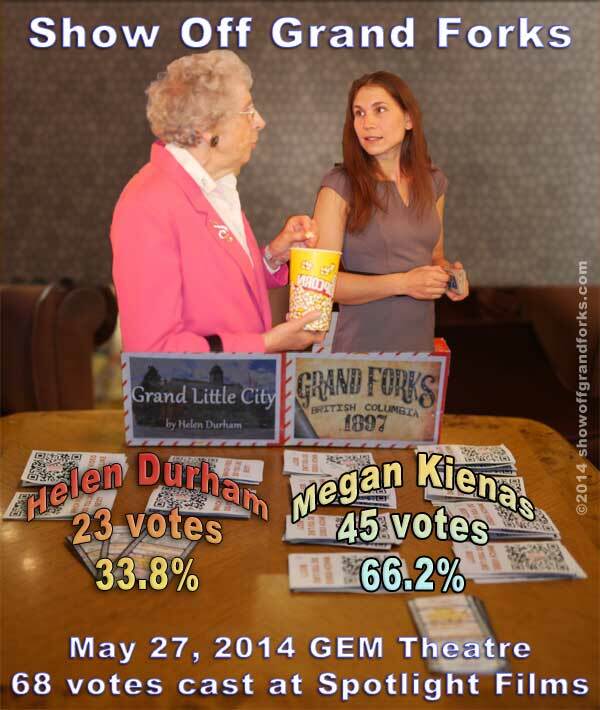 Just before the Spotlight Films Tuesday showing of Nebraska on May 27, 2014, at the GEM Theatre we showed both the entries to the audience on the BIG SCREEN. Then we went around with a pair of ballot boxes and they cast their votes. The results: 68 votes cast. Megan Kienas got 45 and Helen Durham got 23. Which means Megan garnered 66.176% and Helen 33,82%. In my speech to the audience I stated that I would round the kitty up to an even $1000. Thanks to Spotlight films for letting us intrude on their evening. Thanks to the GEM Theatre for helping out with this. Thanks for Lizanne Eastwood and Lorraine Davies-Van Boeyen for being ‘on board’ and the helpful input. Thanks to both Lorraine and Helen for donating money to the prize kitty. Lorraine put in $300 and Helen put in $100. And last, but not least, a BIG Thank You to Megan and Helen for all their hard work and the fine productions they have wrought. Both the movies looked great on the big screen and everyone enjoyed seeing them. This entry was posted in contest and tagged results, vote, winners on May 28, 2014 by lesjshowgf.